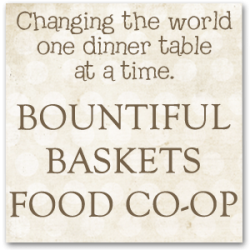 If your favorite Bountiful Baskets site is anything like mine, the question of the day was “What type of melon is this?” The Galia melon’s beautiful name comes from the original grower’s daughter, and its beautiful flavor comes from its parents- the cantaloupe and the honeydew. 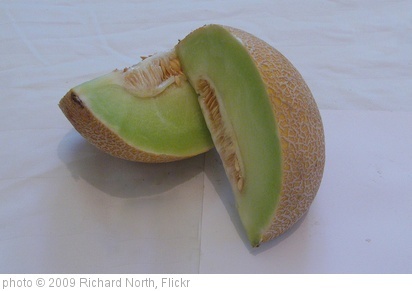 While that original melon was from Israel, the Galia is now harvested in South America and the Southern Untied States. Often called the “Dessert Melon” because of the exceptionally sweet and aromatic flavors, the Galia has a taste more like a cantaloupe than a honeydew. Ripeness is measured not by softness at the stem but rather by color and fragrance. In fact the best of these melons are firm to the touch. Left at room temperature, Galias keep well, but after cutting, any piece you don’t eat should be wrapped and refrigerated to preserve taste. It is said that the Galia tastes best when chilled. Enjoy this fresh, sweet treat plain or use it in place of cantaloupe or honey dew in any recipe. I cut it up and it tasted like watermelon. Took it to work and shared it. Everyone thought it tasted different. I brought none home. It tasted fabulous. I really wish you had later pick up times in Tucson, az! Until you do, we won’t be able to participate.